Since 2005, a RopeCon® system has been transporting inert material along a long valley at the Tu¨fentobel landfill site in Switzerland, which will eventually be backfilled. The belt is being extended in several stages. It discharges the material onto a debris cone directly where it is to be used. Finally in March 2016, a novel concept was implemented which has further increased the flexibility of RopeCon®. Relocating the discharge point of Tu¨fentobel RopeCon® in various stages was part of the overall project plan from the very beginning. The idea was to discharge the material at all times as close as possible to the location where it was to be used. The discharge point has been relocated several times already since the installation went into operation so as to keep transport routes as short as possible for both the trucks supplying the material and the bulldozers spreading it from the discharge point. 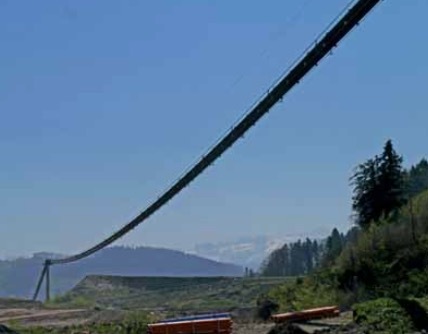 In March 2016, a second RopeCon® was finally installed directly into the rope span of the original system, which now discharges the material onto the new conveyor at a height of approximately 20m. The new RopeCon® system can operate in both directions. This allows for two different discharge points which can be fed alternately. The second RopeCon® system requires no support structure of its own but rather uses the track ropes of the original system. The running wheels of the second installation return onto the track ropes on a set of rails. An important advantage of the extension concept was that even during the assembly work the original system could be kept in operation to the greatest extent possible. Long shut-down periods were thus avoided.